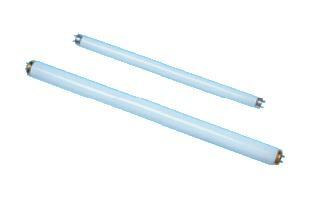 SHATTERPROOF LAMPS - FEP (fluorinated ethylene polypropylene) is at the top of the list of coating materials which allow ultraviolet (UV) passage and appears to be immune to UV degradation effects. FEP is excellent at containing glass and is superior at attracting flies. 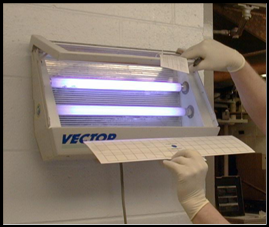 - - - - - - - - - - - - - - - Maximizing the emission of near ultraviolet light is key to the overall effectiveness of any electrical flying insect elimination system. Since many black light lamps deteriorate by approximately 50% (after nine months of continuous use), it is important to replace insect attraction lamps on at least an ANNUAL BASIS - usually at the beginning and continuing through the flying insect season (from April to October).